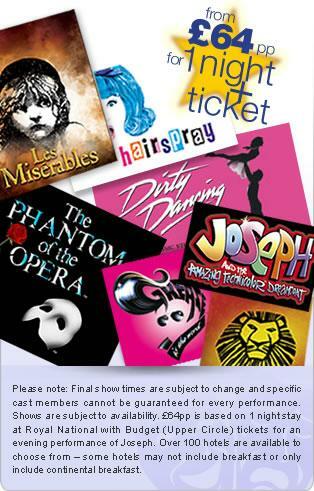 You have the pick of the best seats, all the top theatre shows, and some great added-value extras. Every theatre break package includes hotel accommodation plus theatre tickets, an exclusive directors choice CD, free subscription to Passport to the Arts, worth £20 and a host of discount vouchers for London attractions. 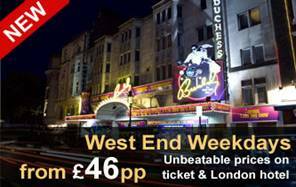 We offer you a choice of the best suppliers, so you dont need to look elsewhere, Midweek theatre breaks are a great way to relax. You can enjoy our nation's capital without the weekend crowds, take in the sights and enjoy a musical or play for a fraction of the cost of a weekend city break. Choose from over 25 superb London shows.